Life has been crazy fun here the past few weeks and sadly blogging has taken a backseat. Wee have had the most amazing weather(until this weekend lol) and sitting inside blogging or sewing has just not been a priority for me. I haven't turned my sewing machine on in over a week and that was to finish a Christmas gift which I can't even blog to show you lol. What I can show you is this. I have been counting down to my 40th birthday since my 36th(that was the 4 before 40 party lol) I have been so excited to turn 40; I'm happy to finally join this club! I do have a little something planned for you, my readers. Tune in tomorrow for more details. I'm off to have some more cake lol. I love the understated, subtle decorations in the garden! Happy birthday. Happy Birthday! 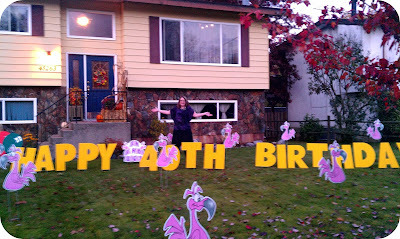 I quietly escaped the hoopla of 40!